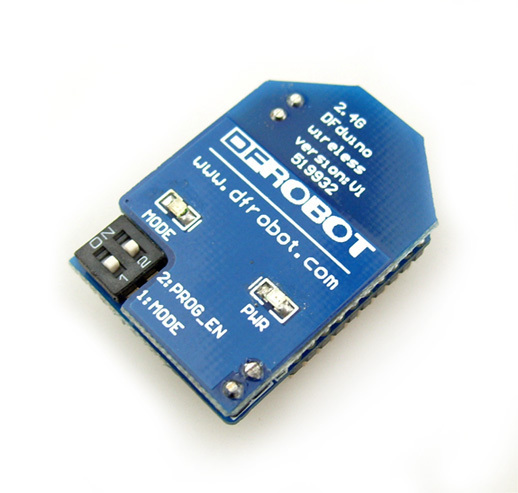 The wireless programming module (WPM) is designed for wireless upload skectch/codes to Arduino. With up-to 5 meters range, you can bring your laptop and do a wireless programming for your already deployed Arduino based devices which is hard to open. Cut the wire, and try this superb communication module. 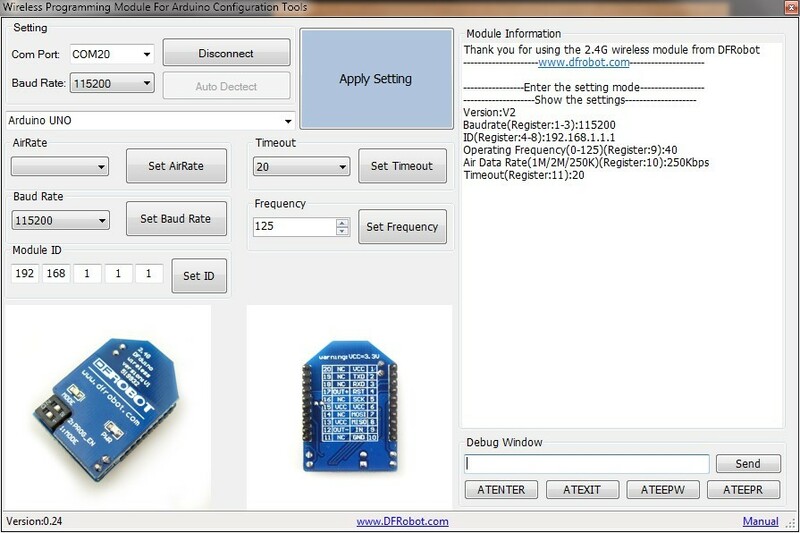 The configuration tools can be used to configure the Wireless Programming Module(WPM). Make sure the "Prog_EN" is at "ON" position. Step 3:Run the configuration tools on Windows. Step 6:Select the proper Arduino board that you are intending to program. 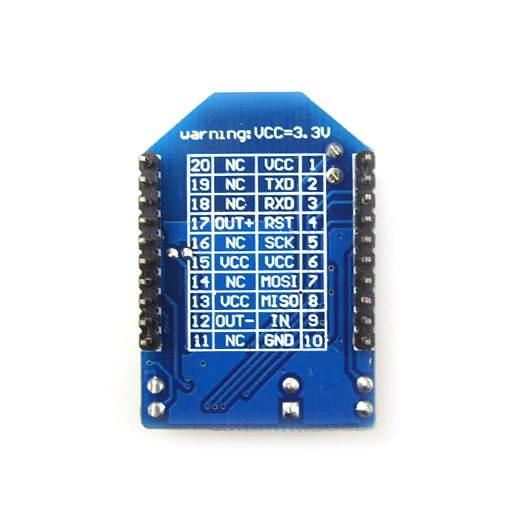 1.When using WPMs to upload code for your remote Arduino processor,you need a pair of this module. 2.As the Arduino board does not have to connect with PC, so do not forget external power supply, such as some batteries. Step 1:Please first set the two WPMs according to the Configuration steps mentioned above. Make sure to switch the "Mode" to "OFF" position. The "PROG_EN" switch should still at "ON" position. Step 3:Plug one WPM on the XBee Adapter and another on an IO Expansion Shield or Xbee shield for Arduino. Step 5:Connect the USB Adapter to your PC, and choose the right com port in the Arduino IDE. Step 6:Open Arduino program in the Arduino IDE and press "upload".Then the "LINK" light will blink if the communication is successful on the WPMs. Upload this code into the UNO board when the configuration and connection have been finished. The WPM has a 11 registers to hold parameters. 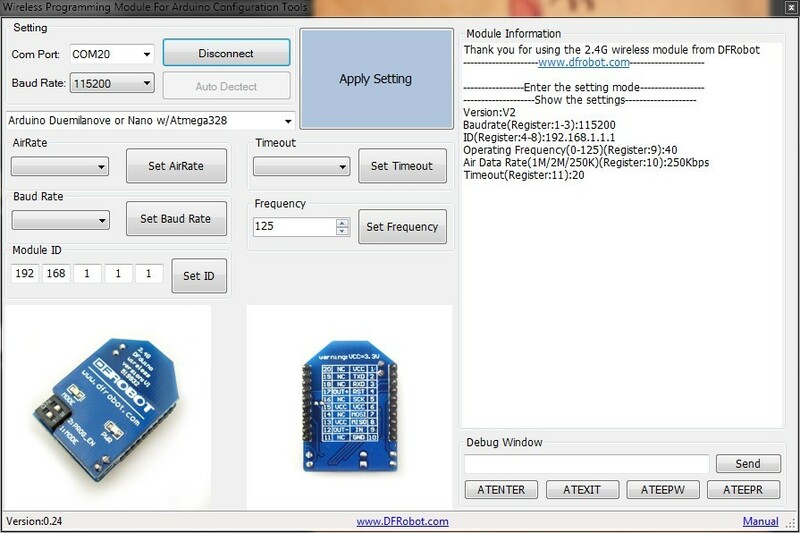 To program various Arduino boards, the baud rate need to be set to match the proper Arduino board before wireless programming. For example, the Arduino UNO has 115200bps programming baud rate while the Arduino Mega 1280 has 57600bps programming baud rate.